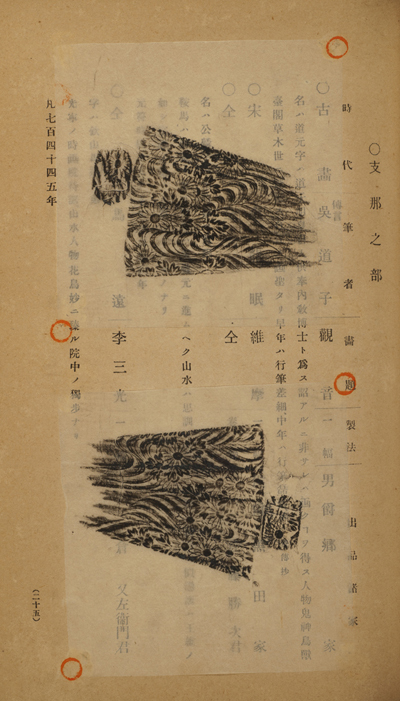 Sometime post-1905, an anonymous gentleman in Japan, wishing to preserve his collection of rice-paper rubbings of setsu kushi hinagata (patterns of miniature combs), took three issues of Japan Art Society Reports from the 37th Year of the Meiji (1905), mounted the rubbings on each page, had the issues bound together, crossed out the original titles and provided one in black ink. 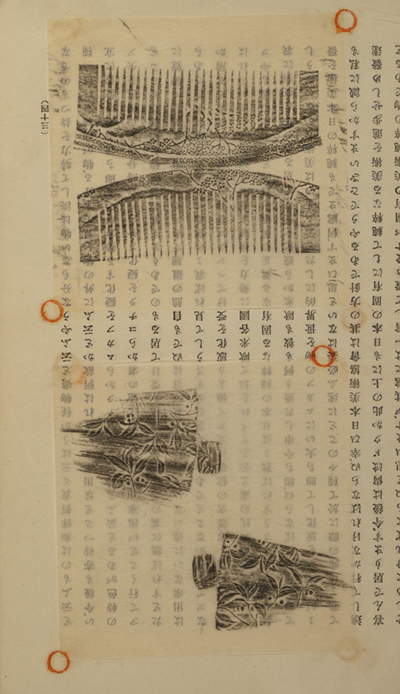 Each page has two rubbed patterns, each pattern with upper and lower views of each comb, and the rubbings are remarkably sharp with even small details very clear. The fact that the patterns on the original combs had been so delicately carved is testament to the artistry brought to bear by their creators. 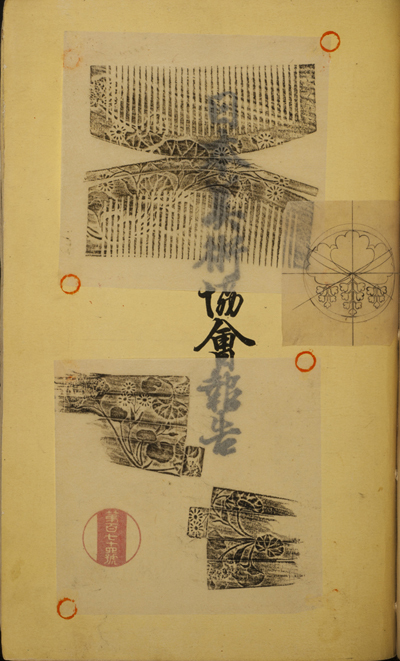 The resulting unique scrapbook features over 500 charcoal rubbings of miniature Japanese combs and hairpins (koagi). 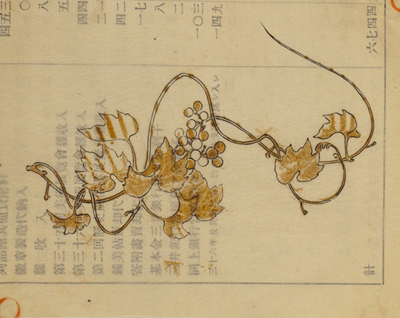 The art of Japanese hair decoration, or kushi, dates back hundreds of years and has rich and varied heritage. As with much Eastern art it served to "beautify items of everyday use, to make the commonplace extraordinary [and] to tell of the life and status of the wearers, who were geisha, courtesans, court ladies, and housewives" (Daruma 35, vol. 9, No. 3, Summer 2002). 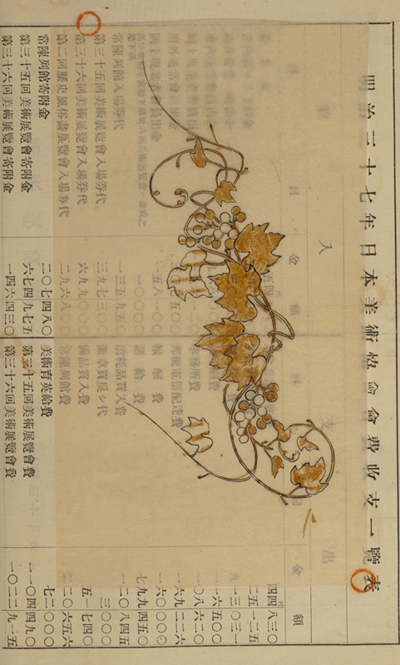 And, indeed, this work is a testament to the beautiful and elegant diversity of this Japanese decorative art. 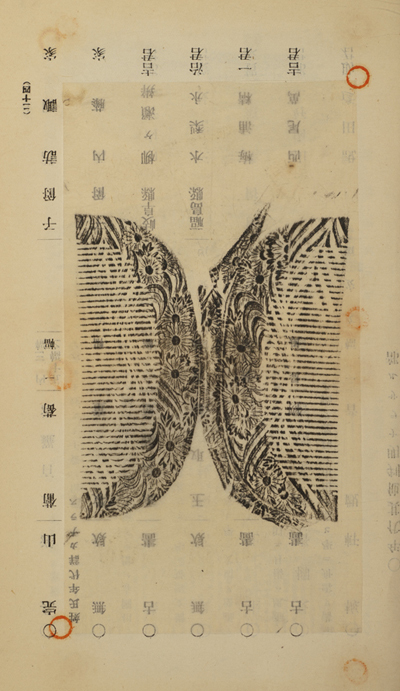 It's a curious, attractive and visually arresting book, one with clear aesthetic merit given the obsessive care and attention necessary to compile such a volume. 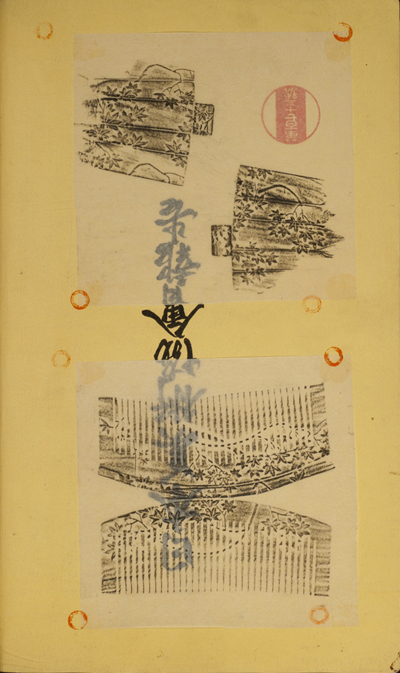 As such, it's a valuable historical, cultural, and artistic record as well as an object that, as much as its subject, renders the commonplace extraordinary, and takes its place along side of Katsushika Hokusai's classic three-volume Imayo Kushi Hinagata (1823) as a key reference. Traditional comb shapes are half moon, horseshoe, and square. 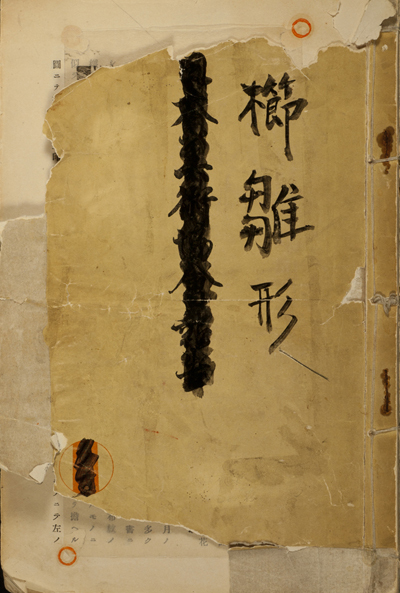 The combs were often worn in concert with koagi (hair pins) in classical Japanese hairdressing. Sakura (cherry blossoms), ume (Japanese plums), chrysanthemums, and peonies are typically employed patterns. "Women have always adorned themselves but perhaps none so subtly as the Japanese. You can reproduce the old hairstyles seen in painting and sculpture but their hair ornaments remind us of the coiffures on which they were worn. In other words, hair ornaments are tangible souvenirs of ancient hairstyles. "Hair ornaments were not mere accessories to feminine coiffure and attire. In keeping with the Japanese urge to beautify items of everyday use, to make the commonplace extraordinary, they were turned into artistic objects mirroring cultural and and social history. They tell of the life and status of their wearers, who were geisha, courtesans, court ladies, and housewives. 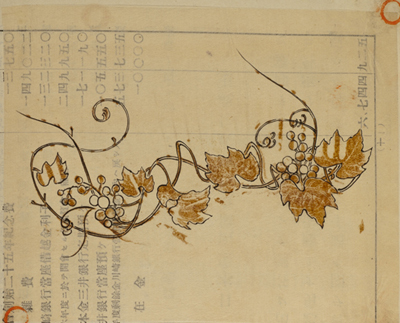 "They give a glimpse of the exceptional beauty of Japanese art..." (Ibid. Daruma). Images courtesy of David Brass Rare Books, with our thanks. Fascinating material, but I must object to the citation of the Daruma article which serves only to exoticize Japan and the "East" along tired cliches for the readers' pleasurable consumption. 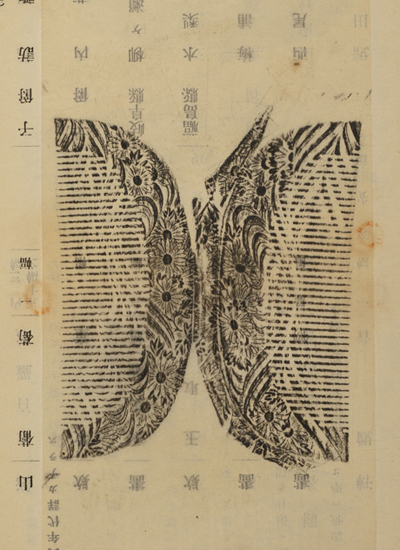 "As with much Eastern art it served to "beautify items of everyday use, to make the commonplace extraordinary [and] to tell of the life and status" - with a bit of digging the author might find that the West has analogous traditions and practices. God forbid that readers "pleasurably consume." We deserve an extra lash for that.